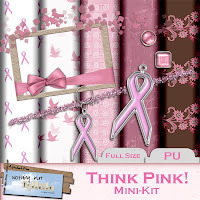 As promised, today I bring you another Think Pink Freebie. 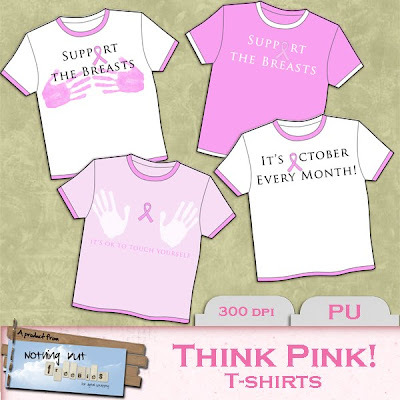 This time it’s a collection of T-shirts with BCA slogans on. As they are made with special permission to use an otherwise PU template I ask you to please read the Credits and TOU before using them - Thank You! I will be back tomorrow with a couple of lovely QPs made from my Danish Design kit “Raspberry and Cream”. See you then? I wonder why all of these lovely and very useful comments always come from "Anonymous"...? If you feel so strong about something let us know who you are. Otherwise - JUST SHUT UP! I wish you - whoever you are - a very nice week and hope that all your anger does not make you the one out of nine that one day is going to need this horseshit attention. Thanks for dropping by - but please don't come again, OK! It is October every month if you take care of yourself (females). That type of exam saved two people I know. Keep up the good work.